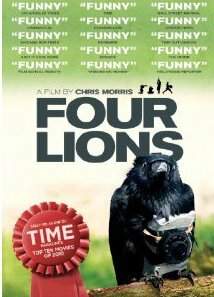 Don't grow too fond of the crow on the cover of Four Lions. I'm sorry to say that Mr. Crow doesn't have a happy ending in this film about four (well, really five) incompetent terrorists in London. You wouldn't think a film about terrorists could be funny, but this one is. The would-be "terrorists" are plagued by numerous difficulties, including in-fighting and being, uh, not overburdened with brains. This group of aspiring terrorists spends most of its time attempting to make videos which will be shown after their deaths. But they can't even manage to get through a video shoot without erupting into arguments. They do eventually begin to develop explosives, but once again, can't come to any sort of agreement about what their target should be. In the end, the film manages to make a very difficult and touchy subject look silly. As a viewer, I found myself feeling both angry at and sorry for the main characters. Each was misguided and lacked direction. Instead of pay﻿ing attention to giving their families a better life, or working to change things, they were all caught up in the idea of "making a statement" without having any clear idea what sort of statement they wanted to make or why. I found Omar's wife Sophia to be the most confusing character of all. She fully supported her husband's wish to become a suicide bomber, but mocked his deeply religious brother when he came to visit. She seemed to have no qualms about becoming a single mother. Even though this film was not meant to be taken as a serious study of suicide bombers, I would have liked to learn more about her character's thoughts and feelings. Overall, I greatly enjoyed the film for its look at a misguided group attempting to make a statement about their beliefs . . . if only they could figure out what those were.